AbanteCart est une application open source d'e-commerce avec panier de commande. 22 Mars - 100MBThis release comes with improvements, bug fixes and default extension updates. 31 Août 2018 - 100MBThis release comes with improvements, bug fixes and default extension updates. 3 Mai 2018 - 100MBThis release comes with minor improvements and bug fixes. Add automatic registration of user and customer IDs in mysql session. 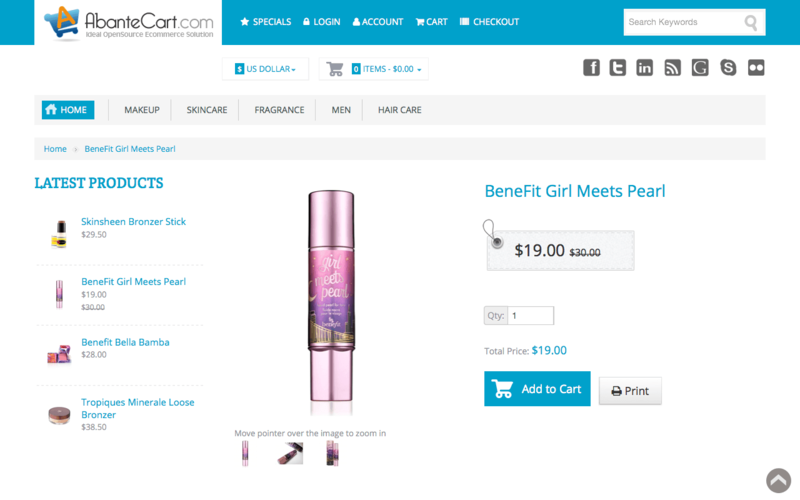 Added ability to show text message "Inc tax" for products with tax included. refactoring of listing_grid response controllers related to hooks. Improve extension priority and run order handling. Improved password encryption and simplified process of password reset. 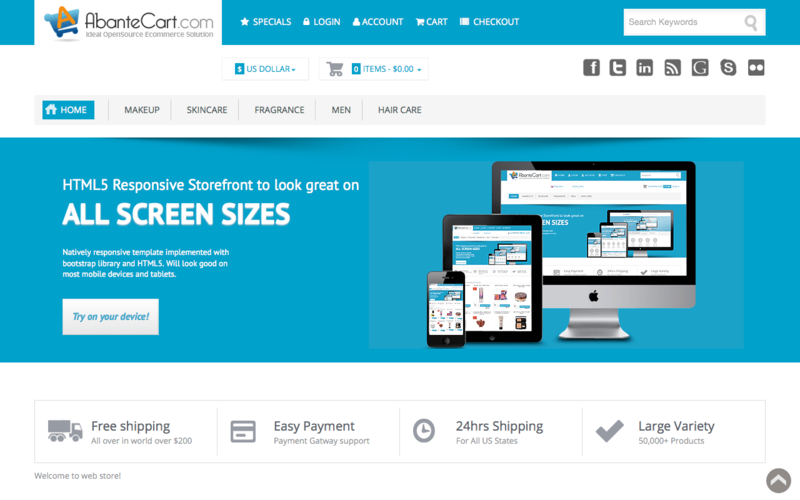 15 Mai 2016 - 65MBWe have put substantial efforts to improve performance of AbanteCart and make it stand out in the performance compare to other ecommerce platforms. AbanteCart 1.2.7 core code, database queries and cache are well optimized to deliver maximum performance. In addition we introduce HTML pages and blocks cache to ease server load on high traffic sites. There is even more in the performance boost with running PHP 7 together with AbanteCart 1.2.7.
added config-setting and expiration for html-cache. Optimized HTML for faster browser rendering. Default multi-value options section fix. FTP Install/Upgrade fix for some rare cases. 14 Mars 2016 - 65MBIn this new version we introduce administrators' and customers' notifications with SMS integration to Textmarketer and Twilio along with better resource library management, better text and HTML editor and more improvements. Improved site performance in the code and with provided Apache server side settings. Fix for storefront search with empty spaces. changes of sale/contact. Added message count that was sent. added new multi-action "set related" to products grid. 18 Novembre 2015 - 65MBIn this version we focused on improving core platform stability and performance along with adding some new features. We have added features for shoppers to have better experience; new easy to use reCapture v2 from Google and now there is a way to request order cancellation. Italian language was added, thanks to Daniela Stucchi contribution. Google reCaptcha v2. Easy to use captcha to protect from robots. added AOrderStatus class. Changed order status management in admin. added mail.tpl for "create account" email. added htaccess with deny rule to admin/system directory and subs. added mail.tpl for "send mail" page. 17 Septembre 2015 - 65MBIn this version we focused on overall improvements for admin usability, such as template management, settings wizard, global search and quick commands. Additionally, AbanteCart 1.2.4 now include system condition check functionality, this is to improve stability of site functionality and report server & system related issues. 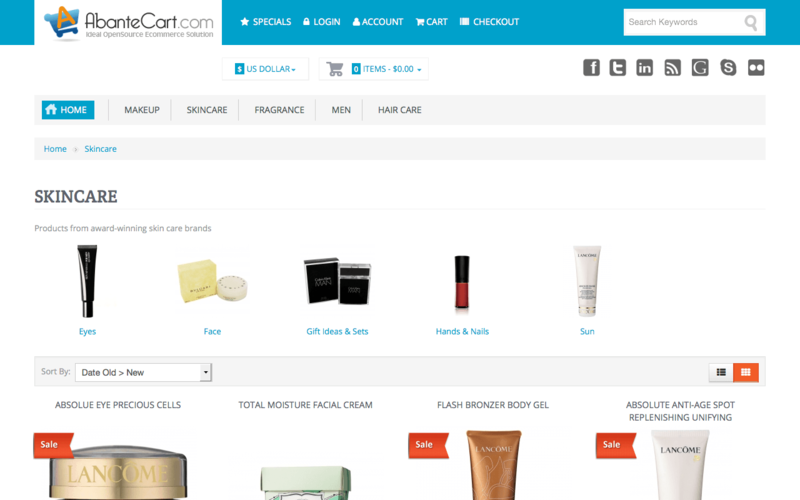 Easy embed codes to integrate AbanteCart into any existing website. Usability improvement if no payment is configured. Number of UI Improvements for admin and storefront. Ability to access storefront models from Admin. added experimental Postgres db-driver. Incomplete. Improve HTTPS handling on admin. Image resizing improvement for png format. Form manager, add files support. Highlight pages with disabled status. Login now remembers user name if login failed. 17 Décembre 2014 - 65MBWe are very excited to announce arrival of new AbanteCart v1.2. 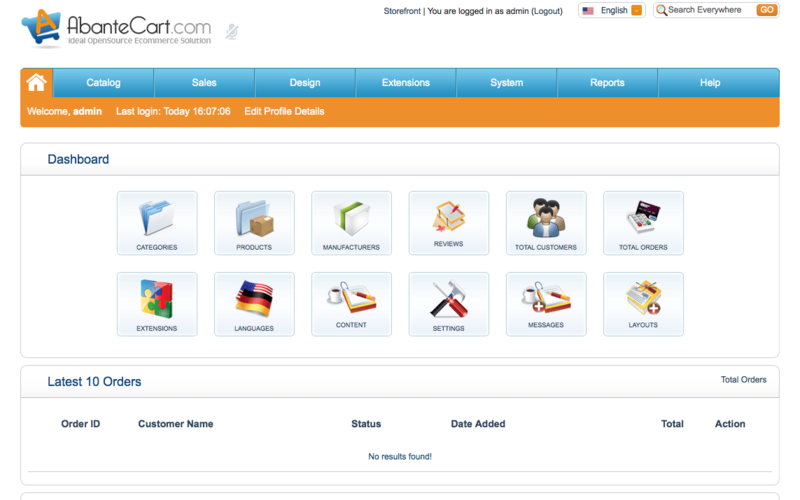 Many hours has been spent in the past few month to design and develop new version of AbanteCart. Version 1.2 is the best work we have ever done with new improved UI and 100% mobile interface for administration and for storefront. Many features are introduced in new version.